The Nissan Juke is one stylish sub-compact sport crossover. But somehow, Nissan Philippines believes it may not be enough of a standout for some people. Hence, they are introducing a jazzed up version, which features both exterior and interior tweaks. Read on for a quick run-down of the features of the new Nissan Juke N-Sport. The most obvious difference between the original Juke and the N-Sport version is the black racing stripes design found at the back of the car as well as on the hood. There are also added decals on the sides of the Juke N-Sport. These added visuals render a sportier look to the already attractive vehicle. The latest version of the Juke also has a rear spoiler that perfectly complements the vehicle’s sloping roofline as well as silver under protector on the front and rear that completes the look. And as if you need further evidence that this is a different version of the car, it also features an “N-Sport” badge at the back. You may also notice that the vehicle has a new exhaust pipe. Although there isn’t much of a difference in the interior of the two versions of the Juke, it is quite noticeable that the N-Sport has door plates that light up every time you open the vehicle’s door. And you’ll be sure to appreciate the new armrest center console, which not only makes the ride more comfortable, but also offers more storage space. Where the car’s engine is concerned, the N-Sport is powered by the same 1.6-liter, 4-cylinder engine that churns out 116 horsepower and 154 Nm of torque. The engine is also mated to the same Nissan Xtronic CVT that is found in the original Juke. How Much Do You Need to Shell Out? Is it worth the higher price? We set out to answer that all-important question for you. First off, allow us to give you fair warning. Do not go to a Nissan dealer for a closer look at the vehicle unless you are prepared to be utterly mesmerized. We can’t quite put a finger on it, but there is something about the Juke (both versions) that just grabs your attention and once it has you riveted, you’ll find it almost impossible to turn away, much less walk away without signing a check for a brand-new Juke. This isn’t to say that the vehicle is perfect. In fact, we will be straight with you and tell you outright that it isn’t. Its most notable imperfection is the transmission, which definitely leaves a lot to be desired. Somehow, the CVT in this crossover isn’t at par with some CVTs we’ve tested in other vehicles. If you’re an extremely observant driver, you would also notice that when you floor the Juke’s accelerator, there is a slight pause before power is transferred to the car’s wheels. The pause becomes less noticeable if you set the vehicle in “sport” mode, but it’s still there. It would certainly be a smart move to give go for a test drive before making a purchase decision so you can determine if this pause bothers you or not. Are the above imperfections enough to make the Juke N-Sport a turn-off? Not in the least. Despite these imperfections, the Juke N-Sport is still an impressive vehicle, just like the original Juke. Its overall compact feel and short wheelbase enables it to handle even the tightest corners remarkably. And although it is a sporty car, it is still highly comfortable to drive, even with the sorry state of our roads. With the difference between the two Jukes limited to the exterior look, illuminated door plates, and new armrest center console, is it really worth paying PHP 50,000 more for the N-Sport edition? The decision, of course, is all yours to make. A vehicle purchase is very rarely decided in rational fashion. More often, the decision is driven by pure gut feel and emotional connection. This could very well be one of those incidences. Make no mistake about it, it will be almost impossible not to feel an instant attachment to the Nissan Juke N-Sport. 2017 Nissan GT-R: Godzilla Has Arrived! Nissan has always prided itself in innovation, and in recent years, they have indeed shown that they are serious in improving their vehicles and introducing new things to their target market. If you’ve been paying attention, then you would have noticed how the company has been launching one new vehicle (or a new version of an existing model) after another during these past few years. Well, it certainly looks like they have no plans of stopping. During the 2016 Philippine International Motoring Show (PIMS), Nissan Philippines showcased the 2017 Nissan GT-R, which is given a well-deserved “Godzilla” moniker. The design and engineering of the vehicle definitely makes it a monster of a car. And while this model has been around for some time, this is the first time it is actually introduced to the Philippine market. So, Filipino car and racing enthusiasts, rejoice! Godzilla is here! The estimated price: A hefty PHP 7.35 million. The new GT-R is not designed according to the demands of aerodynamics. Rather, it is designed to sculpt the air according to its needs. The makers extended that car’s rear fascia at the sides so that air is pushed away from the back of the bumper, thereby helping cool the exhaust. The side skirts and C-Pillar have also been redesigned and refined so as to keep air away from the underside of the vehicle and reduce turbulence. Furthermore, there are larger grille openings at the front to let more cool air enter key components of the vehicle. And the new shape of the front fascia directs the air in such a way that drag is significantly reduced. When you drive this vehicle, you really need to be prepared for the attention it is sure to draw. And as the onlookers marvel at the car’s amazing exterior, you will be sure to fall in love with its equally breathtaking interior. It has semi-aniline leather appointments on the door panels, center console, the shift lever, and the seats. You will also notice that the attention to detail where the air vents and switches are concerned is almost obsessive. 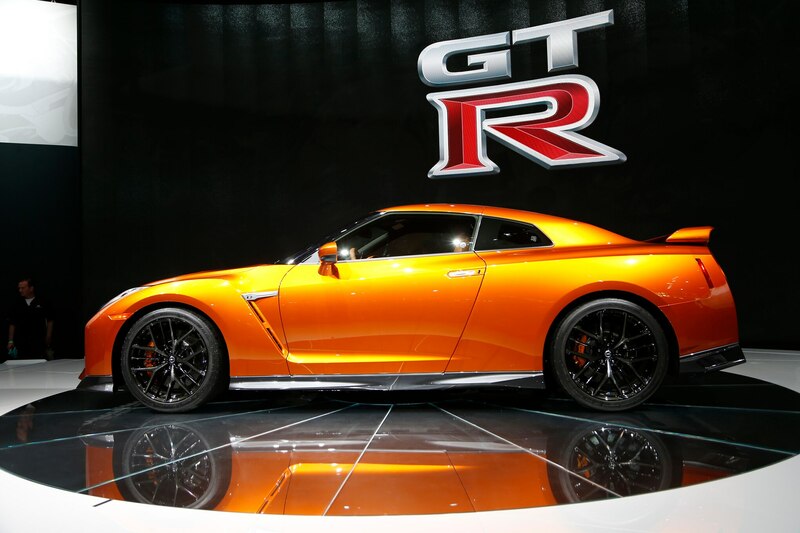 Who wouldn’t appreciate the fact that every single GT-R engine (a 570-horsepower, 3.8-liter, twin-turbocharged V6 engine) is hand-assembled by one of five master craftsmen and carries the name and signature of that craftsman on a plaque? These craftsmen are known as Takumi, and true to the spirit of the Takumi, they think of the mind, body, and spirit of those who will someday use their products while they are creating said product. This is the part of Japanese tradition that injects humanity in the Nissan GT-R. It is also worth noting that the engines are assembled in a clean room that’s dust-free and temperature-controlled, much like the clean rooms used for assembling Formula One racing engines. Top development drivers were then brought together to test the vehicle and make sure that when it is finally launched, it will excel in any track, regardless of the weather, and no matter what level the driver is. The engine and transmission were repositioned farther back so as to lessen the weight at the front of the car. This is said to have a notably positive effect on the handling, cooling, barking, and traction of the car. The car also features an electronically-controlled all-wheel drive system, which maximizes the driver’s control over the car by evenly distributing power among the four wheels; the driver may also send all power to the rear wheels to get more of a racecar feel. The new Nissan GT-R is indeed a pricey toy for the big boys. What it means to sports car enthusiasts is perhaps equivalent to what the latest iPhone means to the gadget-crazy. The answer to the question of whether it is worth its hefty price tag depends on how much of a sports car addict you are. For the average car buyer, it probably isn’t worth the time. But for the true enthusiast, it certainly is worth a closer look. It is definitely a standout when it comes to design, and the technology of the 2017 GT-R isn’t something to scoff at, either. If you’re interested in giving it a closer look and perhaps adding it to your car collection, you’d want to find the nearest Autohub Group because their Nissan dealership is the exclusive GT-R badge representative in the country. The vehicle is available in Gun Metallic, Katsura Orange, Pearl Blue, Pearl White, Ultimate Silver, and Vibrant Red. Last year, the Philippines joined Nissan’s GT Academy for the first time. The results made joining the contest a decision worth making, as the country’s very own Joward Policarpio was declared Asian Leg Champion. Policarpio also went on to graduate from the Nissan Driver Development Program at the Silverstone Racing Circuit, UK, which qualified him for the Dubai 24-hour Race. This year, the country is aiming for another GT win as it begins the first phase of the 2016 Nissan GT Academy. Here in Cagayan de Oro, First Gear (Recruitment) has been happening at the Ayala Centrio Mall for the past three days (August 5-7). Hundreds of Gran Turismo gamers have registered, hoping to become the next Filipino professional racer to make it big in national and international tracks. If you, too, are gearing up to become a professional car racer, or even if you’re simply a racing enthusiast who’s interested in all things racing, then you would certainly want to learn more about the Nissan GT Academy. The GT Academy competition is the first of its kind not only in the Philippines, but across the globe. It aims to assist players of the game Gran Turismo (hence, the GT) in becoming full-fledged professional car racers. Each phase of the competition is referred to as a “gear.” First Gear is Recruitment, which is what just took place at Centrio Mall. At the end of this phase, the 20 players with the best time will move on to Second Gear. Second Gear is the National Finals, where the top 20 gamers from recruitment will be further trimmed down to the top 6. These six players will be the country’s official representatives for the next phase of the competition. Third Gear is the Race Camp Week, where our six racers will compete with players from Australia, Indonesia, Mexico, North Africa, and Thailand. Only one player will move on to the next phase. Fourth Gear is the Driver Development Program, where the GT Academy Champions of all legs will undergo rigorous training at Silverstone. At the end of the program, those who successfully prove that they have what it takes to race professionally will be given an International C License and earn a slot in Nissan’s team for the Dubai 24-hour Race. Agents, employees, contractors, and consultants of Nissan Philippines, Inc. (NPI), Omnicom Media Group, TBWA/Santiago Mangada Puno, A+B Expedio, and Adspin Advertising as well as their families, affiliates, subsidiaries, and associated companies, or anyone who is professionally linked to the competition are not qualified to join the GT Academy. It may too late now to join the competition (unless you can make your way to SM Pampanga, where recruitment happens on August 12-14), but there is always next year. If you’re currently hooked on Gran Turismo and you have dreams of someday being able to compete in a real-life race, then it’s best to spend the next 11 months preparing for the 2017 GT Academy to hit Cagayan de Oro. In the meantime, let’s wait for the National Finals and cheer for the 6-man Philippine team who will move on to Race Camp Week. Hopefully, one of them will succeed in giving the country a back-to-back win. 2015 saw a growing demand for cars in the United States and Europe, allowing Japanese automobile giant Nissan to report a marked surge in their profits. In the nine months leading up to the end of 2015, Nissan’s operating profit rose by 41pc and went beyond market forecasts. And at 8.94 trillion yen, their revenue over that same period was up by 11pc. According to Nissan President Carlos Ghosn, it was most likely their new car models that helped boost their sales, particularly in markets where consumers’ confidence in the brand was strong. Such a strong performance in the US and Europe successfully offset the negative impact of challenging market conditions and unfavorable exchange rates on the company. Their performance in the US and Europe markets also led the company to retain its forecasts—an operating profit of 730 billion yen and revenues of 12.3 trillion yen—for the 2015 fiscal year. Considering the slump in consumer spending in the company’s home market, which was brought about by an increase in sales tax, a healthy growth in the US and European markets is certainly a welcome development. According to statista.com, Nissan is the third best-selling car brand in the United States in 2015, selling almost 75,000 units last year. The same website indicates that Nissan has two car models—Nissan Sentra and Nissan Altima—on the list of 10 best-selling cars in the US in 2015. The company sold 333,398 units of the Altima and 203,509 units of the Sentra in the US last year. Caranddriver.com ranks the Nissan Altima #4 on their list of the best-selling cars in America in 2015. Goodcarbadcar.net ranks Nissan Motor Company #5 in their list of top-selling car manufacturers in January of 2016, with a market share of 9.2%. Nissan is ranked #4 in the best-selling brands category, with a market share of 8.5%. In the best-selling car category (Top 20), the Nissan Altima is ranked #4, the Nissan Sentra #7, and the Nissan Versa #18. In the best-selling SUV category (Top 20), the Nissan Rogue is ranked #2, with 19,762 units sold. In the best-selling truck category (Top 11), the Nissan Frontier is ranked #7 and the Nissan Titan #10, with 6,363 units and 937 units sold, respectively. In the best-selling vehicle category (Top 30), the Nissan Altima is ranked #7, the Nissan Rogue #11, and the Nissan Sentra #16. Among the top 10 best-selling cars in Europe in 2015, the Nissan Qashqai is ranked #6. Down the line, the Nissan Juke is ranked #38, the Nissan X-Trail #68, and the Nissan Micra #74 on the Top 100 list. On a list of the UK’s top 10 best-selling cars so far in 2016 compiled by Top Gear, Nissan has two models included—Nissan Juke at #6 and Nissan Qashqai at #2. Nissan Group is ranked #11 in the list of best-selling car manufacturers in the European Union and EFTA combined for the first quarter of 2016, as reflected on best-selling-cars.com. On the list of best-selling car models in Europe for the first quarter of 2016 posted on the same website, the Nissan Qashqai is ranked #7. Other than Europe and the United States, China has also become a key market for the company, as it has also registered a steady increase in sales—a trend that analysts expect to continue at least for the next few months. Nissan is also banking on the continued growth in the demand for electric vehicles, as they are currently working on a new version of their top-selling LEAF model, which will feature a longer range. Nissan has expressed its commitment to innovation, and the company has definitely shown such a commitment in the way it introduced the world to one new vehicle after another. They’ve created better versions of their classic vehicles as well as all-new vehicles that specifically suit the needs of the market where they are now being sold. It is no wonder, then, that despite some challenging conditions in their home market (Japan) and other markets, they have managed to remain on top where global competition is concerned. Things are definitely looking up for Nissan. Shopping for a family car can be quite challenging. You’ll want a vehicle that can keep your family safe, regardless of whether you’ll just be driving around town or going on a road trip. At the same time, you’ll want a car that offers fuel economy and will last for several years. And if you can get one that also looks stylish, then that would be great, wouldn’t it? Well, here’s good news for you: Automakers have recently become quite adept at combining all these features in their latest car models. This means you now have a good number of vehicles to choose from that every member of your family will be sure to appreciate. This is a 4×4 vehicle that seats a maximum of seven people. You’ll be happy to know that from the boxy car that was a bit crude to drive and not really that attractive, the X-Trail has recently become a lot more stylish and so much easier to drive. It is a very stable and secure vehicle, and you’ll be sure to love the fact that fuel consumption is highly economical, especially if you use it in automatic form. The X-Trail also comes in a five-seater version. If you’re looking for a sedan, then you’ll love the dramatic style and upscale vibe of this unit. It has a spacious and comfortable cabin, which makes it ideal for both downtown errands and longer road trips. It also has an admirable active-safety bundle, which includes automated emergency braking and adaptive cruise control. The safety features and spacious cabin make it easy to understand why this unit is deemed ideal for family use. This large SUV is another Nissan unit that has recently undergone a few changes both in looks and features. The Patrol Royale is a more stylish version of the old Patrol unit, with a bolder V-Motion grille and built-in LED headlights as well as bigger fog light housing with a chrome trim. For your family’s safety, the unit is equipped with full curtain airbags, an anti-lock braking system, and traction and stability control. If your family loves to go camping once in a while, then you’ll appreciate the Patrol Royale’s electronic 4-wheel drive system, which allows for a smooth off-road ride. This all-wheel drive SUV is another unit that could be the ideal family vehicle for those who love to bond in the great outdoors. It rides very smoothly on city roads and doesn’t disappoint even when you go off-road. It can seat a maximum of seven people and will keep your kids entertained via the headrest rear monitors and a total of six speakers in the interior. Not only does the automatic climate control keep you comfortable throughout your journey, but features such as ABS with brake assist, airbags, parking sensors, and immobilizers also keep you and your loved ones safe. More and more people are now choosing to use a pickup truck as a family car, and for good reason. After all, a pickup truck has excellent loading capabilities, perfect for out-of-town trips with the family. If you want to go this route, then the NP300 Navara could indeed be the ideal vehicle for you. Not only is this truck’s exterior and interior very appealing, but it also gives you a very comfortable ride, whether you’re just dropping your kids off to school on your way to work or going on an off-road adventure with the family. Nissan has also thrown in a host of driver assist systems and safety features, so you can be sure your family is safe as you travel to your destination. It has indeed become a lot easier to find a family vehicle that successfully combines utility, comfort, safety, and economy. Perhaps the most difficult thing for you right now is making the choice as to which particular unit to buy for your family. It may be a good idea to start with a visit to your nearest dealership and check out the five Nissan units discussed above. The good news is, any of them would be a wise choice. Many car critics, car dealers, and car enthusiasts have already expressed their admiration for the Nissan Navara. This truck has been tested countless times on several types of terrain, and it has proven worthy of praise. But if you think Nissan is done making changes and improvements to the Navara, think again. The auto industry was in for a pleasant surprise this year, as Nissan Philippines unveiled a brand new variant of their popular pickup truck—the Nissan Navara Sport Edition. And while no one really pointed out any problems with the look of previous Navara variants, the cosmetic improvements seen in the Navara Sport definitely add to its overall appeal. To better appreciate the recent changes to the Navara, perhaps a quick comparison with the 2015 NP300 Navara is in order. As you can see, there isn’t that much difference between the 2015 NP300 Navara and the 2016 Navara Sport where the engine/transmission as well as the dimensions and weight are concerned. As mentioned earlier, most of the changes made to the model have to do with the way it looks. For one thing, it has a bolder honeycomb grille supported by a new front skirt as well as very attractive fog lamps in dark-chrome finish, side steps, and rear bumper. The Navara Sport also has a new roll bar with LED lamp and a protective bed-liner. But the one improvement on the Navara’s exterior that not only makes it look better, but also makes it perform better are the model’s new 18-inch alloy wheels; handling is so much better because of these new wheels! Inside the cabin, you’ll see a few more tweaks, all of which are meant to add to your comfort and bring the vehicle into a class of its own. Cabin features such as the steering wheel, the door trim, the shift knob, and the arm rests are now all wrapped in leather, giving the entire cabin interior an ultra-sleek appeal. You’ll be sure to feel the luxury the moment you get into this new Navara variant. Of course, true to Nissan’s commitment to giving their riders the best road experience at all times, the 2016 Navara Sport still boasts of a 5-link coil rear suspension with stabilizer as well as zero-gravity seats. This means you’ll experience the same seamless ride you get from previous Navara variants, no matter how rough the road gets. The perk is that you can now get that kind of comfort in a much better-looking truck! You can see that the Sport Edition is just a little bit more expensive than its predecessor, but that’s just to be expected, right? After all, it is a new and improved version. In fact, it’s a very pleasant surprise that the difference in price isn’t that big! And when you come face-to-face with the new Navara Sport, you’ll be sure to agree that the higher price is definitely worth it. On the Nissan Philippines website, the 2016 X-Trail is marketed as a confidence-boosting, testosterone-driven sport utility vehicle. But, that’s not to say that this compact SUV is designed mainly for guys who demand respect on the road. The new X-Trail’s sleeker design and much larger seating capacity makes it more of a family car with an attitude, rather than a testosterone-filled pony that only attracts cowboys and muscle-bound car enthusiasts. The 2016 Nissan X-Trail is a collaborative effort between Renault and Nissan. According to the Japanese car manufacturer, the X-Trail will go by another name in North America—the Nissan Rogue. And unlike its predecessors, the new X-Trail will don a variety of changes, making it a completely redesigned model. One of the most prominent changes is its 7-seater capacity. With the increased seating, you’d think that it would be uncomfortable to cram in seven adult passengers. Well, you’re wrong. The 2016 Nissan X-Trail is actually very comfortable, with a decent amount of leg room. This is why many car enthusiasts see it as an excellent family car. One of the design aspects that resulted from the collaborative efforts of Renault and Nissan is the CMF or Common Module Family platform incorporated into the design of the new X-Trail. This particular platform enables the use of very lightweight materials like aluminum, thus resulting in an ultra lightweight vehicle with reduced fuel consumption. You don’t have to be a rocket scientist to figure out that weight has a significant effect on fuel efficiency. The lighter the car, the less effort the engine exerts to move it. And lesser engine exertion usually translates to fuel economy. Additionally, the designers at Nissan and Renault have given the SUV a more muscular and sleeker appearance compared to its predecessor. It features higher mudguards and taillight designs that resemble a boomerang. The headlights are equipped with LED daytime running lights, while the roof rack features two additional headlight reflectors for night driving. The 2016 Nissan X-Trail is available in three models; S, SV, and SL. The SL model comes with the standard 2-row seats, while the S and SV trims comes with the optional third row seats. And depending on the trim, the 2016 X-Trail will feature either 17″ or 18″ alloy wheels. The ground clearance is around 210 mm, while its angle of departure is about 24°. The new Nissan X-Trail offers both 2-row and 3-row seating, with the latter option comfortably seating seven adult passengers. This option, however, is only for the S and SV models. The SL trim will only have the standard 2-row seats. So for a family of five, the X-Trail S or SV will certainly make for a very spacious, comfortable, and stylish vehicle. The 2016 X-Trail’s cockpit features a new navigation system and LCD touch screen. The standard models will also include a Bose audio system, power steering, electric mirrors, a new and improved Nissan Connect system, manually operated air conditioning, and a keyless entry system with central locking features. The optional features available include a rear-view camera, glass roof, stylish leather interior, automatic air conditioner, power front seats, navigation system, and a top-of-the-line entertainment system and touch screen console. For safety, all models will include front and side air bags, electronic brake distribution with ABS braking, brake assist, and a blind spot detection system, among others. The 2015 X-Trail was one of the best 2015 vehicles for rough road driving and long distance trips. The 2016 X-Trail is just as comfortable and exciting to drive in the same conditions. Unlike its predecessor, however, the 2016 X-Trail is a practical choice for a family car. Although the 2016 model has the 2015 model’s 2.5 liter inline-4 supercharged engine, it will be paired with a 6-speed Xtronic CVT automatic gearbox. Manual transmission is not available for this model though. Estimated power output is around 170 horse power, with about 175 foot-pounds of torque. It’s not the most powerful engine, but it does the job quite efficiently. And the fuel economy is excellent at about 19 km/L at highway speeds. The 2016 model will have a front-wheel or all-wheel drive. Upon hearing the words “car care,” most people would automatically think of car wash, waxes, and other cleaning products. But, there’s a lot more to car care than maintaining the outward appearances of your vehicle. Car care includes maintaining the performance of your engine, making sure that your tires are well balanced, ensuring that all the fluids in your car are clean and filled to the right levels, interior maintenance, air conditioning, windshield wipers, and so on. All these different aspects should be covered when you talk about car care. When it comes to car care products and cleaning practices, there are many misconceptions and mistakes that most car owners fall victim to. These myths and misconceptions may not seem like much, but in the long run, they can significantly reduce the aesthetic value and quality of your vehicle, which is the exact opposite of what proper car care practices are supposed to do. If you like to compare your car to that fancy china you got from your wedding, then by all means use detergents to wash your car. You need to understand, however, that detergents are formulated to remove everything from the surface, which is why your plates are so squeaky clean after every wash. This means waxes, silicones, and polymers; everything that is in your car’s paint finish. Use detergents several times in washing your car and you will have achieved nothing but expedite the oxidation process. For the best results, especially when you consider the hot weather in the Philippines, you need a car wash product with the proper pH balance and conditioners that are specially formulated to not only bring out the shine in your car’s finish, but enhances the protective qualities of the automotive paint finish as well. This is where most car owners often get confused. Despite washing and cleaning sounding very similar, they are actually two very different processes. Washing, or the use of a car wash product, only removes loose dirt and grime from the surface of your paint finish. It is basically the initial stage of the cleaning process. If you want to remove stubborn contaminants, stains, blemishes, and oxidation, you’re going to need an effective cleaning agent, such as a clear coat-safe paint cleaner. These types of cleaners will remove contaminants that simple washing can’t. You can blame modern-day marketers for having caused this much confusion about the difference between polishing and waxing. By naively misusing these terms, some people now believe that polishing and waxing are interchangeable. They are not. Polishing is entirely different from waxing, not just in the process but the purpose as well. The sole purpose of polishing is to bring out a high gloss from the car’s paint finish. This is what car show enthusiasts use to bring out the shine, or the bling, from their showroom cars. Waxing, on the other hand, is more of adding protection to your car’s finish. Wax, resin, polymer, sand silicone are some of the most common ingredients in waxing agents that provide superior protection for your car’s finish, especially against harsh elements. Always monitor the level and efficiency of your engine coolant. Driving in a tropical country like the Philippines, you can expect vehicles to get really hot, especially under the hood. If the coolant isn’t effective or if the coolant reservoir isn’t filled to the proper level, the engine could overheat, which is exactly what you don’t want to happen when travelling long distances on a hot day. Monitor refrigerant levels and check for leaks in the AC system. Although Nissan cars are already known for great quality air conditioning systems, you still need to apply proper maintenance to keep that smooth flow of cooled air going during extremely hot weather. Make sure that the refrigerant charge is at the right level, and remember to check for leaks in the system before adding refrigerant. Here at Nissan CDO dealership, you can find all kinds of car care products to help you keep your vehicle in tiptop shape, both in performance and in appearance. From windshield wipers of all shapes and sizes, to top quality car batteries and motor oil, everything you need is but a stone’s throw away at your local Nissan dealership. Nissan has been very busy these past few months, introducing new models as well as the latest versions of their trusted old models. Among the models they have recently revamped is their large SUV, the Nissan Patrol. Now known as the Patrol Royale, the model has received a number of cosmetic improvements as well as a few interior tweaks. Nissan boasts that this is the first four-wheel drive vehicle that’s specifically designed to work extremely well even in the Middle East region, which has the type of climate that demands a lot from automobiles. Let’s see how it measures up. The V-Motion grill of the new Patrol Royale is significantly bolder, with three bars at the center and two bars at each corner. This new grill replaces the one with the honeycomb design. The built-in LED headlights with LED Daytime Running Lights are also new (the DRL has an automatic on/off function) and the fog light housings are bigger and features a new chrome trim. At the back of the Patrol Royale are clear taillights that now feature revised clusters. The revamped SUV also features an all-new set of 20-inch wheels. The steering wheel of the Patrol Royale now has wood trim, unlike the old model, which had a steering wheel fully wrapped in leather. What remains the same is the leather trim in the automobile’s door panels, the center console, and the chrome accents that still brightens up the tan-colored interior. This means the look and feel of the car’s interior is pretty much the same as it was with the previous version of the Nissan Patrol, except for the steering wheel. And guess what? It’s not just the wood trim that’s new about the steering wheel. The telescopic steering wheel is also powered with memory, along with the driver’s seat. Another feature that makes the car’s interior interesting is the tri-zone climate control and Bose Premium sound system, which is equipped with a total of 13 speakers. Plus, the Patrol Royale also boasts of a push engine start with Intelligent Key and 2 x 7-inch headrest-mounted WVGA monitors. The vehicle is also spacious enough to seat a total of eight individuals. The latest version of the Nissan Patrol is powered by a 5.6 liter V8 engine that produces 526Nm and 371 PS of torque. The engine is mated to a 5-speed automatic transmission that also features a manual shift mode. And because Nissan boasts of the car’s off-road capabilities as well, it has also been fitted with a full-time electronic four-wheel drive system with three settings: 4-Low, 4-High, and Automatic. Where driver assist and safety equipment are concerned, Nissan equipped the new Patrol Royale with Limited Slip Differential, Hill Start Assist, Hill descent Control, six full-curtain airbags, traction and stability control, and an anti-lock braking system with EBD. The vehicle also has clearance sensors at the front and rear, with an Around View 360-degree camera. Perhaps the biggest change made to the Nissan Patrol isn’t in its exterior appearance, in its interior, or in the machine. Rather, it is in the adjustment of the model’s price. The Nissan Patrol used to sell for PHP 4.9 million, but is now being offered at PHP 3.9 million. That’s a million-peso price cut! Where else can you see such a significant price reduction for a car model that has been improved in both appearance and function? Apparently, nowhere else but at Nissan. The company has definitely made the large SUV accessible to a lot more people. There’s no question about it. The Patrol Royale’s price is definitely good news to those who have been waiting for its release. Other than the price, though, is the Royale really an improvement on the classic Nissan Patrol? Our answer would also be a resounding YES! Nissan’s engineers went through the evaluation process for over 200 prototypes and spent over five decades honing what has now been introduced as the Patrol Royale, and it shows. The Royale has very smooth response and is kept flatter by its Hydraulic Body Motion Control (HBMC) system. It also has considerably less body roll when you change lanes and turn corners, thereby giving you an extremely comfortable riding experience within the city as well as top-notch stability on sandy and rugged roads. It also boasts independent suspension on both front and back ends, as well as 275/60R20 tires. The Nissan Patrol Royale is offered in Pearl White and Obsidian Black. This may just be the ride you’ve been waiting for. Always innovating, constantly improving. That’s the kind of image Nissan wants to be known for, and they are indeed working hard to cement that image. This year, they are introducing to the Philippine market the latest version of their sub-compact car, Almera. The previous version of the Nissan Almera is now improved with new interior and exterior designs, plus a new engine variant, they are hoping to make the model the new car of choice of every Filipino family. According to Nissan Philippines, Inc. (NPI) President and Managing Director Antonio Zara, the 2016 Almera is the “perfect partner for all new beginnings.” Let’s take a closer look to see if what he claims is indeed true. This 2016 model is supposed to be a better version of the Almera, right? So, what exactly has changed from the previous model to this one? The best place to begin is at the car’s front end, which now a new bumper, a new grille, and a new set of headlights. The new bumper adds an angular shape to the otherwise round design of the car. The larger V-motion grille and boomerang-shaped headlights identify it as a sister if the Sylphy and the Altima. Now let’s take a look at the side of the new Almera. It features a new set of 12-spoke alloy wheels along with a design that gives it more of a sporty look. At the back end, it has a revamped bumper that features a black diffuser, a chrome trunk garnish, and a redesigned lip spoiler. More than the exterior, though, it’s what’s inside a car that matters to most consumers. So, what does the 2016 Almera’s interior have to offer? Well, the new center console layout now has piano black and silver trims. Additionally, the new instrument cluster features Fine Vision gauges and the redesigned three-spoke steering wheel definitely looks a lot classier than the one in the previous model. The new Almera also boasts a multi-information display and rear air conditioning vents, along with leather seats for the model’s top-range variant. Other than that, the car’s interior also boasts of having ample space. NPI also says the car comes with a remote keyless system, iPod connectivity, and AUX/USB input. You can also expect to find standard safety features in the 2016 Almera, including electronic brake-force distribution, brake assist, anti-lock braking system, and dual front airbags. What’s under the hood of any car is also a very important consideration. After all, you can only truly enjoy the looks and comfort your car offers if they come with top-notch performance. The new Almera allows you to choose between two drivetrains. With the entry-level model, you get a 1.2-liter, 3-cylinder engine with CVT technology. It generates 79 horsepower at 6000rpm and 106Nm of torque at 4400rpm. It is connected to a 5-speed manual transmission. The other models give you a 1.5-liter, 4-cylinder engine that generates 99 horsepower at 6000rpm and 134Nm of torque at 4000rpm. The 5-speed manual transmission of this engine is mated with a 4-speed automatic transmission. Aside from all these upgrades, Nissan’s new Almera models also got a few tweaks in suspension to give you a sportier driving and riding experience. Furthermore, this car’s spare parts cost less than the previous version’s. That, coupled with the fact that the upgrades lead to longer intervals between periodic maintenance, translates into a 30 percent reduction in the Almera’s maintenance cost. The car now has the lowest maintenance cost in its class! These five Almera variants will all come in four different colors: Alpine White, Bluish Black, Brilliant Silver, and Titanium Grey. If you’re planning to buy a new car and have a sedan in mind, you may want to check out the 2016 Almera. Mr. Zara promised that this is “the ideal car that will be with you and your loved ones through many of life’s important milestones.” Now that is definitely something worth looking forward to! After all, a car is one investment you’d want to benefit from for many years to come.